In line with their country’s proud heritage of turning horror into an art form (Goblin, Death SS, Lucio Fulci, Mario and Lamberto Bava, et al) Hands Of Orlac (HoO) blend horror with vintage Doom Metal. (Apparently the moniker itself refers to a cheesy 1960s horror film featuring a young Christopher Lee.) This is the Italians’ first full-length via a Danish label which has recently been coming up with some interesting propositions. HoO prove to be a creative quintet and manage to infuse a stream of great ideas into their music, making their take on the genre an intriguing one. Sometimes, however, I got the feeling that these ideas remained underdeveloped. For instance HoO make prominent use of a flute – interesting concept but in reality these flute melodies sound a tad bland. There are other examples I could list but I reckon I’ve made my point. The female lead vocalist of HoO has a solid voice which reminded me of pre-1990 Metal bands such as Girlschool, Black Widow and Chastain. I liked her style - so it’s with a grudge that I admit finding her singing a tad too refined for the raw Doom of HoO. 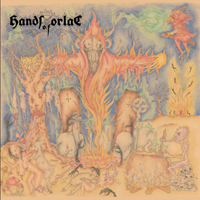 “Hands Of Orlac” never gets boring and despite my reservations it remains a fairly strong debut. One thing’s for sure, the album has succeeded in putting my ears on full alert in anticipation of the band’s next move.